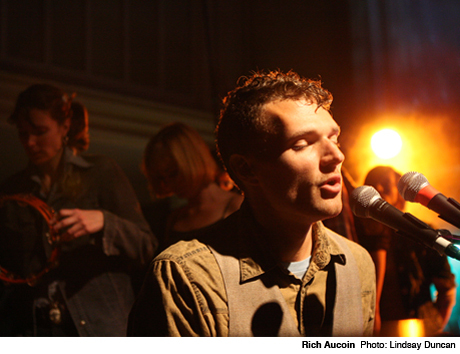 All-inclusive popsmith Rich Aucoin turned heads this year with his guest-heavy LP We're All Dying to Live, and the Halifax native will keep plugging the disc via some more North American tour dates. We can only imagine, however, that the bulk of the 500-plus musicians that popped up on the platter will be staying at home. Aucoin caps his 2011 across the pond, with dates in Amsterdam and Reykjavik, but he brings his show back to Canada to play perhaps one of the most Canadian of institutions: Hockey Night in Canada. Aucoin will be performing at Hockey Night in Canada's Game Day on January 7. From there, he plays Guelph, Toronto and Montreal before doing handful of shows scattered across New York, Louisiana, and California. You can check the schedule below, as well as watch his rather wild new video for We're All Dying to Live track "It."